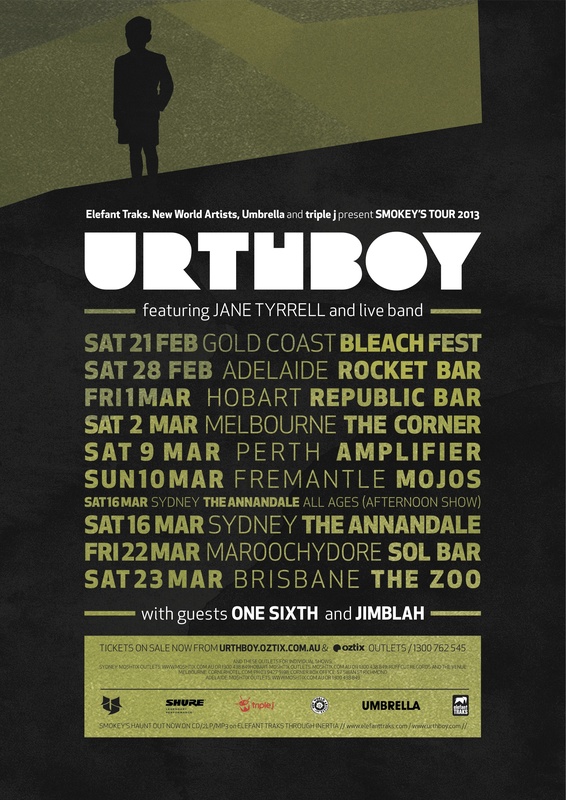 Fresh from releasing one of the most talked about albums of 2012, Urthboy hits the road with a new live band and a j Award nomination. Urthboy’s new album Smokey’s Haunt has received a phenomenal response after debuting at #14 on the ARIA Album Chart. It was triple j Album of the Week, The Australian gave it a 5 star review saying it was “absolutely captivating” and it was announced just this morning as a nominee for the 2012 j award. From Rolling Stone to The Sydney Morning Herald and beyond, Smokey’s Haunt has been lauded for its storytelling, receiving 4 star reviews across the board with many calling it Urthboy’s most accomplished album. Fittingly, he’s put together a live band and a refreshed sound to tour the album in 2013 alongside cohort Jane Tyrrell. If you’ve been to one of their shows you can testify to the infectious spirit of their live performances—there’s a warmth to the music that perfectly suits live drums and keys. Supporting are two recipients of the Hilltop Hoods Initiative, the latest Elefant Traks signing Jimblah (whose star is on the rise with his signature soulful hip hop sound) as well as One Sixth, the exciting young MC hailing from Namibia and residing in Melbourne, whose stunning debut album Electronic Mail just dropped on Obese. All pre-sale ticket buyers will receive a free MP3 remix of Knee Length Socks by Trials. Tickets on sale now. Smokey’s Haunt is out now on Elefant Traks.